Stuart, Florida was ranked as having one of the top ten beaches in Florida by the Huffington Post. What strikes most visitors about the beaches on Hutchinson Island besides the white sand and the beautiful Atlantic Ocean is the lack of people. The beaches are not crowded. The beach is 25+ mile long and is in three towns, Stuart, Jensen Beach, and Fort Pierce. Hutchinson Island on the Treasure Coast of Florida only has two hotels on the Island and does not get that many tourists. Most tourists head south to the more populated areas South of Martin County. 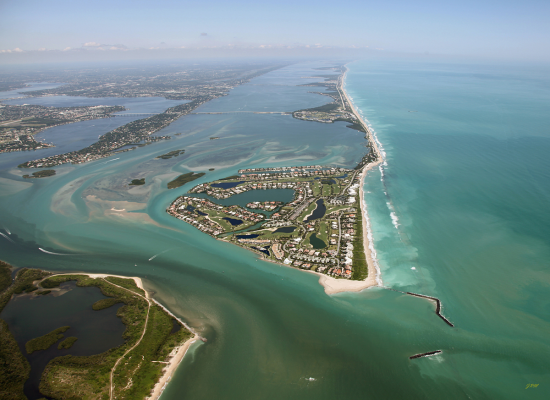 The Ocean front towns of Martin County consists of Stuart, Jensen Beach, and Hobe Sound. Martin Counties main goal is to keep it's small town feel and they have done a great job. No traffic jams and a very low crime rate. About 50 years ago, the County fathers set aside 15 access points in Stuart and Jensen Beach with paved parking. Two of the beaches have snack bars and picnic areas. 30 total public access points on South Hutchinson Island from Sailfish Point to the Fort Pierce Inlet. You can actually find Beach access points where you will be the only person on the beach. One of the favorite beaches is Bath Tub Beach. Protected by a reef in the shape of, you guessed it, a bath tub. Only one more condo complex can be built on the Island in Jensen Beach just North of the Island Dunes condo/country club complex. Mangrove wetland areas and increasing setbacks from the dunes for building have limited future building sites so it looks like the beaches will not get crowded in the future. Two ocean front restaurants, Pietros is upscale, and Shuckers. Both have decks overlooking the beach. Shuckers is one of my personal favorites on Saturday and Sunday with a band in the afternoon on the beach deck. Fishing from the beach is excellent and we have some great surfing locations. Two causeways connect the Island to the mainland. Many residents chose to live on the mainland and walk, ride a bike, or take a very short ride to enjoy the ocean breeze. You can also take dogs on leashes on the beaches in Martin County except the two beaches that have life guards and you can also enjoy an alcoholic beverage on the beach as long as you do not take glass containers. Most beaches in Florida do not allow beverages or dogs anymore. So if you are looking for a nice old Florida feel and great beaches visit Stuart or Jensen Beach. Ocean front condos start at $200,000 from the third floor up and will have spectacular views. Hutchinson Island ocean front homes can get a pricey. Some of the locals are a little upset that the secret about our beaches got out, so if you visit do not tell them you heard from me, just mention the Huffington Post. I would like to keep on telling you how great our beaches are but I am hearing the call of the waves rolling in so I am going to grab the dogs, a frosty one, and head out. Hope to see you on the beach soon.